I got back into boardgaming in 2012 after receiving a copy of Epic Spell Wars of the Battle Wizards: Duel at Mt. Skullzfyre. Before that I had a copy of Catan and Carcassonne from high school and college. Since 2012 though I’ve been playing regularly and acquiring quite a few more. I wanted to cover a couple of my favorites I got in 2015. Roll for the Galaxy (Amazon) was my favorite game of 2015. Each person is building a galactic empire by discovering new worlds and developing new technologies. Every turn you roll a cup full of dice and decide what actions you want to perform. As the game progresses it becomes easier to manipulate which dice end up in your cup and what actions you can take with them. I like the engine building aspect of the game, even if you’re not winning it’s neat to see the machine you’ve built start to work. I also enjoy managing the dice odds by choosing which dice to pursue and which to remove. I picked up Flash Point Fire Rescue (Amazon) in an Amazon sale for < $20. It ends up on a lot of best of cooperative games lists. 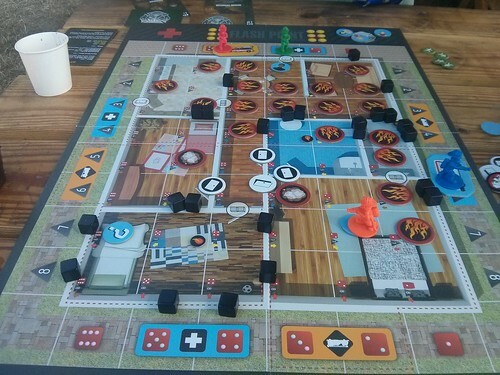 All of the players cooperate to fight a fire in a burning building and rescue a number of victims. I like cooperative games as a way to take a break from competitive play, but that doesn't mean they're less stressful. I like watching the mechanics of a cooperative game and how they ramp up the difficulty. In Flash Point, it's how the fire spreads and how it becomes easier to spread the longer the game plays. You can also chop through walls, but that makes the building unstable and the game end faster. My final favorite of the year is Castles of Mad King Ludwig (Amazon). Each player builds a castle floor plan of their own design trying to place compatible rooms closer to each other in order maximize their points. They also take turns setting the prices of the shared room pool to maximize their cash. I like games with modular boards you build as the game progresses. This is also a fun one when it finishes because everyone has a different wonky castle to show off. The same company makes a more Sim City style game called Suburbia. Other games I purchased this year: Welcome to the Dungeon, Pandemic: Legacy: Season 1, Champions of Midgard, T.I.M.E. Stories, Dixit, Love Letter Adventure Time, Bandu, and the sequel to the game that started it all for me Epic Spell Wars of the Battle Wizards 2: Rumble at Castle Tentakill. How do I find time to play all these games? Every week I meet up with Dave, Pinguino, and Craig to play games. It’s nice to have a regular group of 4 people since most games target that many players. It’s also who I played the cooperative campaign style games Pandemic Legacy and T.I.M.E. Stories with. At my company we host game night every fortnight. The structure is more loose since we never know how many people will show. A few of us also took a trip to Big Bear to hang out in a cabin last summer. We managed to play 13 different games on the trip.